Thomas Newman, who worked with Sam Mendes as composer for "American Beauty", "Road to Perdition", "Jarhead" and "Revolutionary Road" took over scoring duties from David Arnold, who had worked on the previous five James Bond film. Arnold commented that Newman had been selected by Mendes because of their work together, rather than because of Arnold's commitment to working with director Danny Boyle as composer for the Opening Ceremony of the 2012 Summer Olympics. After months of rumours, singer-songwriter Adele confirmed that she had written and recorded the film's theme song with her regular songwriter, Paul Epworth in October 2012. 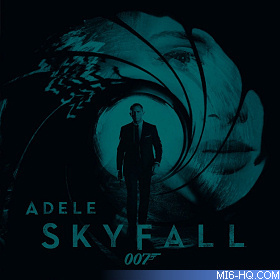 Adele later posted the cover for the "Skyfall" sheet music on Twitter, crediting the songwriting to herself and Epworth, with arrangements to both Epworth and orchestrator J. A. C. Redford. 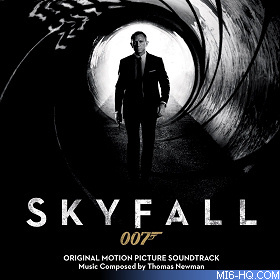 The song was released online at 0:07am BST on 5 October 2012, a day dubbed "James Bond Day" by the producers as it marks fifty years to the day of the release of Dr. No. It shot to #1 in the iTunes charts the next day. A CD release follows on October 29th, 2012 that includes an instrumental version of the title theme. The single release of 'Skyfall' by Adele on iTunes reached the iTunes Top 10 charts in 21 countries on the first day of release, and made the number 1 spot in the following countries: UK, Germany, Belgium, Finland, Greece, Ireland, The Netherlands, Portugal, Spain and Sweden.